Died 22 Oct 1961 in Elkhart, Morton County6, Kansas. Arthur married MARY AGNES HARPER 24 Feb 1904 in Greenfield, Dade County, Missiouri, daughter of WILLIAM HARPER and CAROLINE LAWS. She was born 2 Feb 1885 in LeRoy, Faribault County, Minnesota, and died 29 Apr 1953 in Guymon, Texas County, Oklahoma. Arthur was the 4th child in a family of 13 (10 were girls). All the children were born in Iowa, then the family moved to a farm north of Greenfield, Missouri in the spring of 1900. This was land that Timothy received for his Civil War Service. That is where Arthur met and married Mary Agnes. They were only in Greenfield 7 years when they moved to homestead a farm in Cimarron Co., OK, in the township of Hidalgo. The farm was 7 miles Northeast of the present town of Keyes, OK. Arthur said the family moved because they were "tired of farming rocks". They farmed with Arthur's parents, his brothers Milton and Gussie, and his brother-in-law Lawton P. Palmer. The family lived in a dugout until 1921 when they built a new house, which they ordered from a mail order catalogue and put together themselves. Arthur and Mary lived in the house until after the death of Mary, when Arthur moved in with his son Maurice, who lived 1/2 mile from the original homestead. He lived with Maurice and his family for less than a year before he passed away. Arthur loved the Lord and the church, and he also loved to read. He took the National Geographic from the early 30's and kept all the maps, because he loved the maps. His library included many deep theology books as well as some history and geography books and a few good fiction books from the 30's and 40's. He loved to discuss what he felt would happen in the future, as revealed in Biblical prophecy, and he had many books written from as early as 1880 about the "end times". He also loved to sing and had a rich deep bass voice. His granddaughter, Marilyn, remembers that as she would practice the piano, he would sing along with her. He also knew a great many funny songs that he would sing to her and make faces as he sang. He would also entertain her with tongue twisters, and his deep laugh when she would try to repeat them is a fond memory that she has. Mary was born in LeRoy Twp, Faribault Co, Minnesota and moved with her family to Greenfield, Dade, Missouri when she was about 3 years old. After her marriage to Arthur Rose, she moved with him to Cimarron County, OK, where they lived in a dugout from 1907 to 1921. 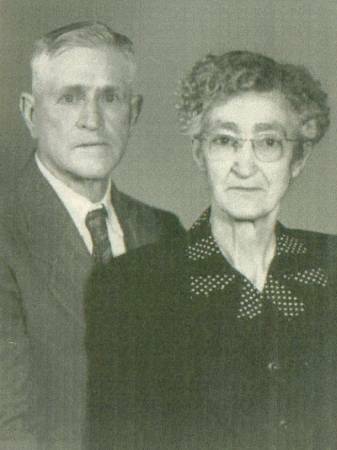 They were members of the Church of God in Elkhart, Kansas, however, after about 1940, they attended the Church of the Nazarene in Elkhart, Kansas. Mary is remembered as a very stern but loving woman. She was a good cook and her chocolate sour milk cake was a favorite of all, however, due to her diabetes, she never was able to enjoy it herself. Mary is buried in the Elkhart Cemetery in Elkhart, Morton, Kansas. Medical Information: Mary suffered from diabetes most of her adult life, and was on a very strict diet.